For an infant’s parents, teething can be a time of incredible excitement and joy. For the baby, this time can be accompanied by various symptoms such as excessive chewing and drooling. However, these symptoms are almost always mild. As well, some children do develop a slight fever when this process starts. This fever, however, is also mild and short lived. Unfortunately, many have mistakenly assumed that any fever, even one which is severe, is simply part of the normal process with a new tooth. Our Pediatric dentists in Colorado Springs have been informing patients that high fever is not normal. Recent studies have shown that severe fevers are not a normal part of teething. Parents should heed this insight. Please take the advice of pediatricians. If your child’s fever reaches over 100 or lasts for a day or seems severe in any way, please call your doctor immediately. This is likely a symptom of an infection. Researchers publish list of common symptoms when infants are teething. Fevers are not included. Parents welcome the arrival of baby teeth as a sign their little pride and joy is developing along normal lines. But it’s not always a comfortable process for the baby … or the parents. Now a meta-analysis of 10 studies from eight countries concludes there are common symptoms during the time that primary teeth emerge. These include irritation of the gums and soft tissues as well as irritability and drooling. But while these symptoms are annoying, they do not usually become serious medical problems. In fact, researchers said fevers are usually not symptoms of teething. This key finding is important to remember because parents whose infants develop high fevers should not assume it’s related to the surfacing of baby teeth. They should seek medical care for their children. The findings were published today in the journal Pediatrics. If your baby’s symptoms are mild and more representative of the above stated normal behaviors, your job as a parent is to simply help them just get through it. Cooled chew rings are one excellent option. However, if they are more severe, please take them seriously. (CNN) The commonly accepted conclusion that growing teeth causes fever among babies has been recently debunked by a medical study. 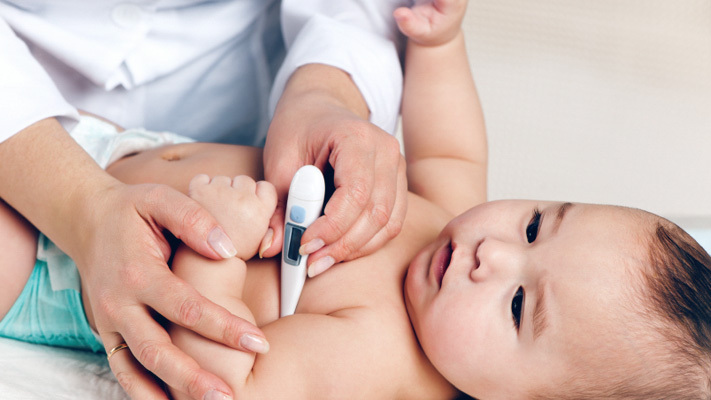 The professional finding suggests that fevers may be caused by factors other than teething. The commonly accepted conclusion that growing teeth causes fever among babies has been recently debunked by a medical study. The professional finding suggests that fevers may be caused by factors other than teething. It was also noted that the sprouting of teeth among babies are expected to cause drooling and swollen gums but fever is a different topic. “If a child has a really high fever, or is in significant discomfort, or won’t eat or drink anything for days, that’s a red flag for concern,” explained American Academy of Pediatric Dentistry’s Pediatric Oral Health and Research and Policy Center director Dr. Paul Casamassimo in a CNN report. This is a time of joy for parents. It will also involve some discomfort for some children and inconvenience for parents. But this only happens once for the child. Remember to relax, make them comfortable and share pictures of the new pearly whites with family. And remember as well to schedule the infant’s first dental appointment with a pediatric dentist before the age of one. Preferably by the time the 7th or 8th tooth has begun to erupt through the gums.